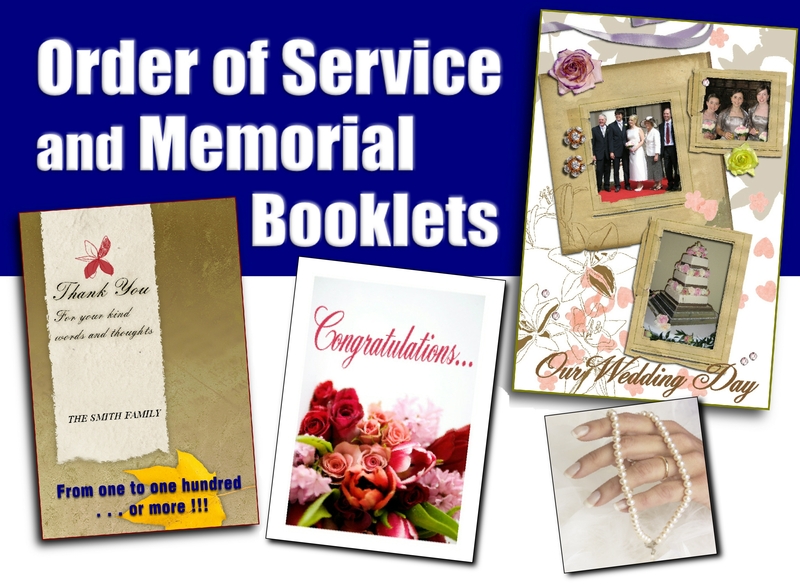 At momentoprint we specialise in urgent Order of Service and Memorial Booklets, Concert and Special Event Programmes. Our automatic Imposition Software means we can easily produce Booklets from almost any file application. Alternatively, we are able to design your Artwork from text, or email files, or even from hand-written copy. All completed with a variety of folding, stapling and binding options. Our Invitation Card options are also ideal for Invites to your Special Occasions, Weddings, Parties, Baby Christening’s, Bat and Bar Mitvahs, Birthdays . . . in fact any formal, or informal, event. Additional printing options, including raised type, Thermography, Gold and Silver gilt-edging, and special Creasing, Folding and Drilling options are also available. In most instances, we are also able to supply matching Envelopes. Thermography, or printing with “raised type”, has traditionally been associated with classic Stationery and Invitation printing . . . and over the past decade had declined in popularity and availability. However, there has recently been a renaissance in this most unique, and stylish, form of printing. At momentoprint we are now delighted to be able to offer a wide range of printing items using this classic printing method. We can thermographically print on classic Conqueror Stationery Paper and matching Board and can even supply gilt-edged cards and special Gold and Silver Foil printing and Embossing for an even more “exclusive” finish. Thermography uses a heat and powder process to “draw” or “lift” the ink up off the paper. Alternatively, type or images can be “blind embossed” or “foil embossed” to give the effect of a raised finish without any ink at all, or perhaps a “shiny” foiled effect. or we can design and produce artwork for you. Just telephone, email, or call-in to our Crouch End office for more information. For more information, and EXCLUSIVE savings, on many of our most popular printing items at our momento on-line-only pages, as well as pre-notification of our occasional one-off special “Just4 2Day” printing vouchers (one-day-only offers on selected items), subscribe to our E-Newsletter here at the “Subscription” panel (top right of this page). For our “Just4 2Day” special offer discounts, follow us at Twitter . . . or at Facebook. or call on 020 8340 3490. Posted on March 8, 2019, in Cheapest Printing Online, Leaflets Printing, Printed Invitations, Printers in North London, Urgent Business Cards Same Day, Wedding Stationery Printing and tagged Business Cards Same Day, Cheap leaflets printed, Cheapest Printing Online, cheapestprintonline, Ebook design and publishing, Flyers, Folded Brochures, Graphic Design, Leaflets, London Printers, Luxury Matt Laminated Business Cards, Postcards, Printed Invitations, Printers in Crouch End, Printers in North London, Urgent Business Cards, Wedding Stationery. Bookmark the permalink. Leave a comment.